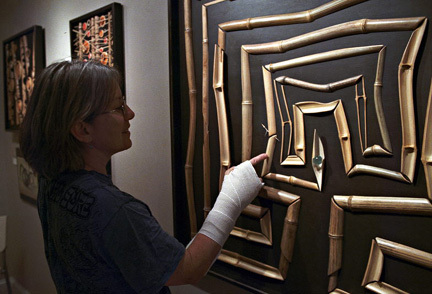 That’s me with broken arm pointing to the appropriate passage in my bamboo labyrinth. Photo is courtesy of my good friend, Bucks County photographer Joseph Zogorski. My bamboo works-in-progress are on hold until my radius is healed and strengthened. Consolation prize: Thrilled to report that I’ve received an Honorable Mention award by the 2012 American Bamboo Society Arts & Crafts Awards Competition. There will be an article about my bamboo mosaics in a future issue of Bamboo magazine. I’ll keep you up on that! 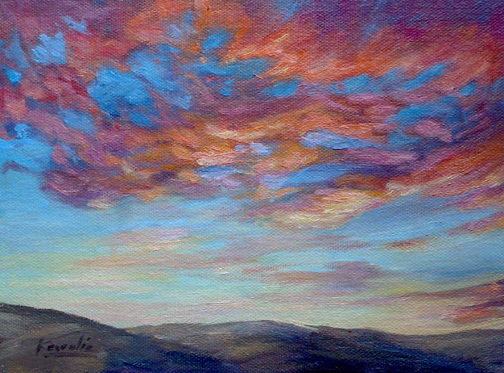 For now I’ll be continuing to do landscape paintings with my non-dominant left hand, and some right hand use. It’s pretty amazing how much muscle control you could develop quickly, by simply working them; not without pain though! From wood mosaics, to silverpoint drawings, to paintings – I consider myself fortunate to be able to turn to any of these forms of expression when I want to – or need to. “Journey” is the focal point of the work that I created for the September show at the Artists’ Gallery in Lambertville, NJ. 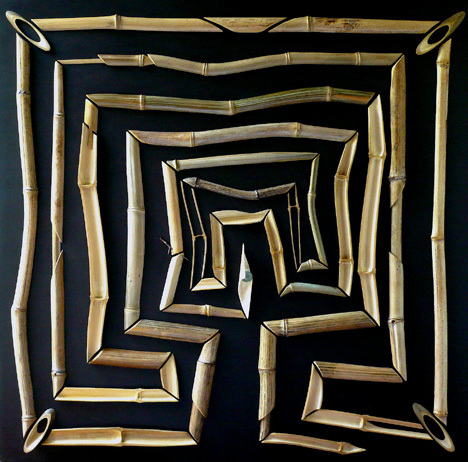 This is a bamboo labyrinth, symbolizing a life journey, with the twists and turns, trials, and hidden layers of the human experience. Labyrinths are symbolic pilgrimages, having spiritual or religious significance. These paths are located all over the world, and have been depicted on ancient coins, pottery, basketry, and floor mosaics for about 4000 years. Unlike mazes, wherein the traveler is faced with multiple paths or dead-ends, a labyrinth has a single, possibly difficult, path that always leads to the center. 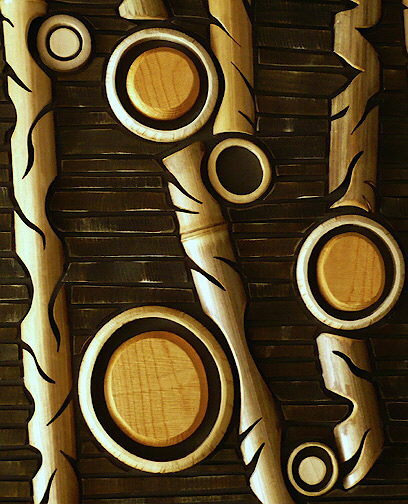 Follow the bamboo path to the center, and notice along the way that I’m also letting it serve as a sampler to show some of the many directions I could pursue using bamboo as a design element. Let’s stop here for a minute… It’s too apt a symbol to pass up – because two days ago I broke my right arm, a most important tool of the trade! My radius is being held together with not a thorn but a metal plate. Check back here for the paintings that I’ll be doing for the next few months, with my left hand, and my right when I can manage. Until then, I hope during the month of September you can take a scenic drive along the Delaware River. 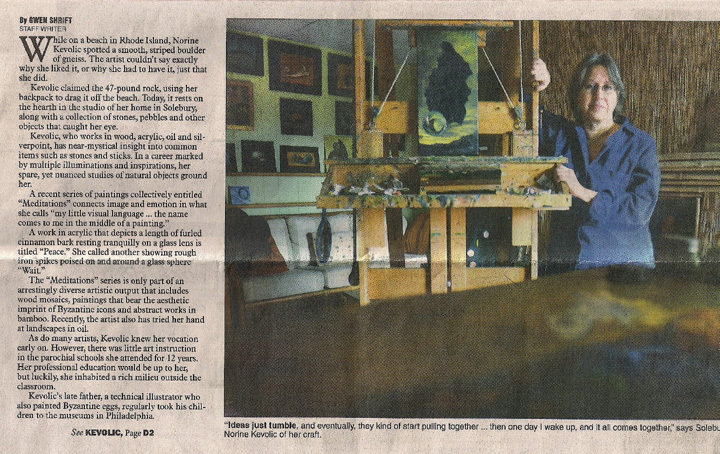 Stop into the Artists’ Gallery at 18 Bridge St., Lambertville, NJ to see what Charlie Katzenbach and I created for our show “Expressions in Wood, Glass, and Bamboo.” It will be up until September 30. 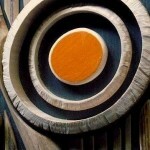 In this work, I wanted to show the beautiful flexibility and strength of bamboo. 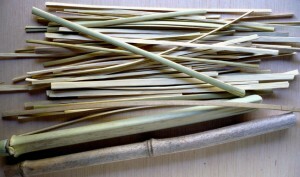 I used a knife to split a piece of bamboo into thin strands of varying widths. 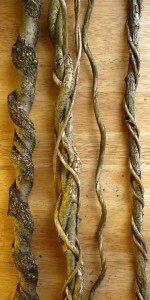 The strands had to be flexible enough to insert into two holes and bend into elegant arcs across the panel. Beginning on September 7, I’ll be pairing up with Charlie Katzenbach for a month-long exhibition of our “Expressions in Wood, Glass, and Bamboo” at the Artists’ Gallery in Lambertville, New Jersey. There was no time to follow the path of each and every idea I had, but the ones I did finish illustrate the many separate directions I could explore. 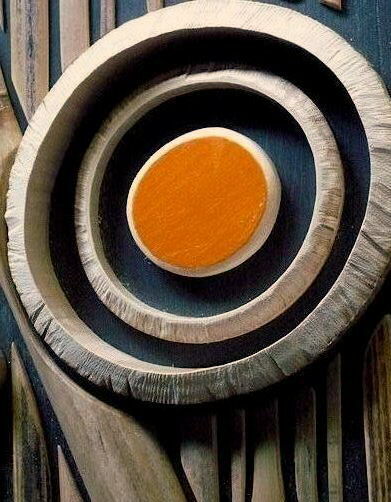 I’m still just tapping the surface of how to use bamboo as a mosaic design element. 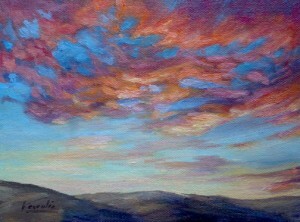 “Jubilation” will be on display at the Artists’ Gallery for the month of September. I hope you’re in town for the show! If not, check back here where I’ll be adding photos of the event. I clean my mosaics with a feather duster or a brush with soft, long-haired bristles. 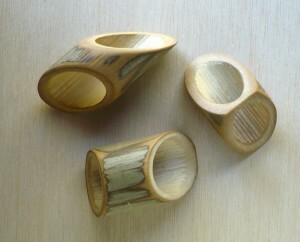 It is tedious work, but I love doing it, and finding ever more ways to show the beauty of bamboo. Each piece matters, and is sculpted in some way, first some rough shaping on band saw, followed by hand-tooling and finishing. Early on in this mosaic, I sanded all the large rings nice and smooth – but then found that that wasn’t working for me. 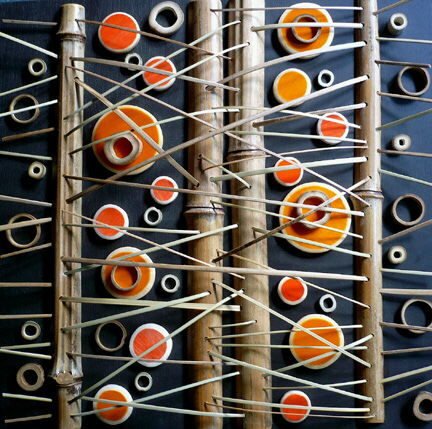 It took a while before I realized the work needed more texture, more contrast to the smooth, elegant strips of bamboo. I took the rings and re-worked them in a controlled way, using the band saw. This takes a good amount of time to do by careful manipulation of the rings to achieve a certain texture while running them through the saw. Don’t try this at home! It’s between your skills and the blur of an eager blade with millions of tiny teeth! I do everything myself, from start to finish, including building the frames. Nope, they’re not built yet. The mosaics I create between now and September will be included in my 2-person show with fellow co-op artist, Charlie Katzenbach, at the Artists’ Gallery in Lambertville, NJ. All details will be posted soon! 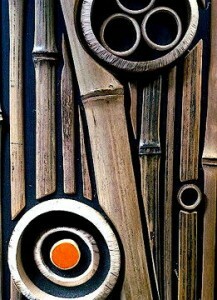 Detail of Pipe Dreams, my latest bamboo and wood mosaic. The full mosaic measures 24″ x 24″. Please take a look at the previous 3 blog posts to learn more about the progression of this body of work. It takes real concentration to stay close to the first impression we receive when an idea is born, especially when many ideas are hitting at once. I follow one lead at a time, then the next one that becomes clearest, then the next… I constantly take stock of where I am with each step. Sometimes things aren’t working, and we don’t exactly know why. But, we will no doubt discover why if we continue to pay attention. This may may mean letting it go for a while, come back to it renewed and refreshed. We nail it when we nail it, there’s no mistaking that feeling. A creative person isn’t really content unless she invents. We need to make our feelings happen somehow. This is a detail of my work-in-progress bamboo mosaic illustrating the growth of ideas. Since the start of this project, which will be part of a 2-person show in September (details later), I’ve spent many weeks experimenting with ways to cut and use the bamboo I’ve been collecting. This kind of sustained effort is highly exciting and rewarding because, while you are busy working, the mind is tapping ever deeper into an ocean of creative possibilities. Ideas are growing and surfacing naturally while you’re in a state of focused exploration, so grab a scrap of paper and record those fleeting things, you can’t get to them all now. This is how it works for me…Something got your attention? Absorb it, wonder why, do something with it – play, use it somehow. Chances are you’ll become obsessed with it and you won’t (can’t) quit until you invent something uniquely your own. Be you! 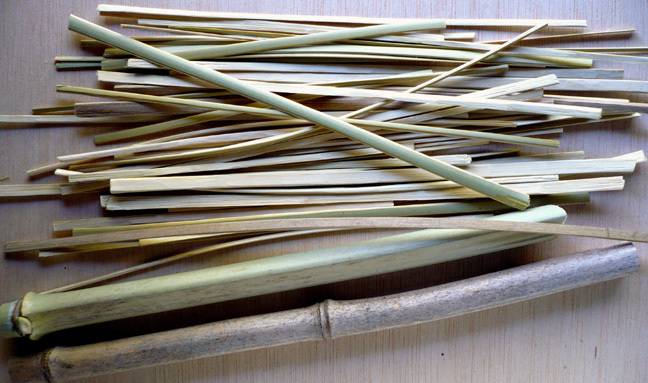 Since the last blog post I’ve been working with my natural palette by cutting bamboo stalks (see foreground) into thin, flexible strips. Bamboo can hold a very sharp edge or point, but the edges of each of these strips are hand-shaped by yours truly, and feel smooth to the touch. I’ve also been cutting bamboo on various angles, creating interesting markings on the outer skin by sanding through here and there. All edges will be smoothed with a knife or sandpaper. The sides that will be mounted to the wall panel must be sanded flat. Each piece of the mosaic will be a finished “sculpture” in itself. 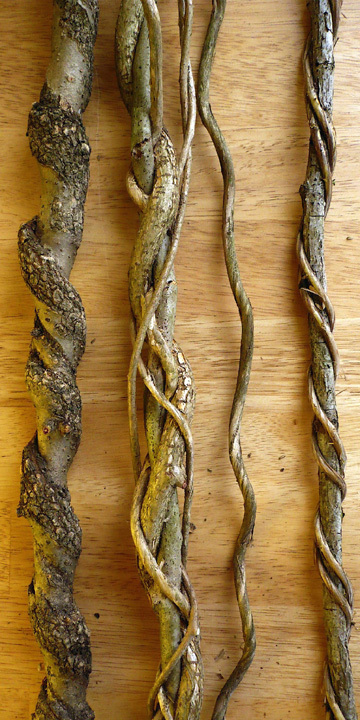 And, I’ve been de-barking twigs to create patterns, no sense asking why, and connecting these to bamboo rings. This idea came from something I saw in a Native American museum in Montana a few years ago – the teepee (tipi or tepee) tent flaps were secured at the entrance with decorative strips similar to this. Functional and beautiful. I couldn’t wait to try them myself! It’s a long journey to simplicity! At this point, I have nothing in the way of a finished composition for a natural mosaic, still experimenting and doing quick drawings as the ideas emerge, but I can feel things coming together the more I work with my materials. Each step in this process matters to me, from collecting, selecting, cutting, composing…and each step is given my full attention over an extended period of time. I receive great satisfaction in developing an idea into something visible, tangible.… In this case, it’s a hand-crafted co-creation with nature. Your comments and emails are always welcome! Gathering a natural palette is my first step in creating any artwork, whether for a painting, or in preparation for a “natural” mosaic. 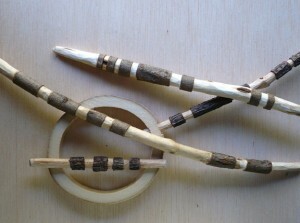 I have in mind to include these and other found objects into future bamboo mosaics. Certain things attract my attention: the spiraling vines of varying thicknesses and textures, the neat thistle patterns, the round pods that seem suspended in these long thin twigs… The question of how to use them will come soon…for now I’m still discovering my palette, in the woods and along back roads. As my ideas develop and expand I’ll post more images. Meanwhile, I pay great attention to intuition; subtle nudges help me make choices all the while. Right now I have no idea what will happen. But, that’s exactly what I love about creating! 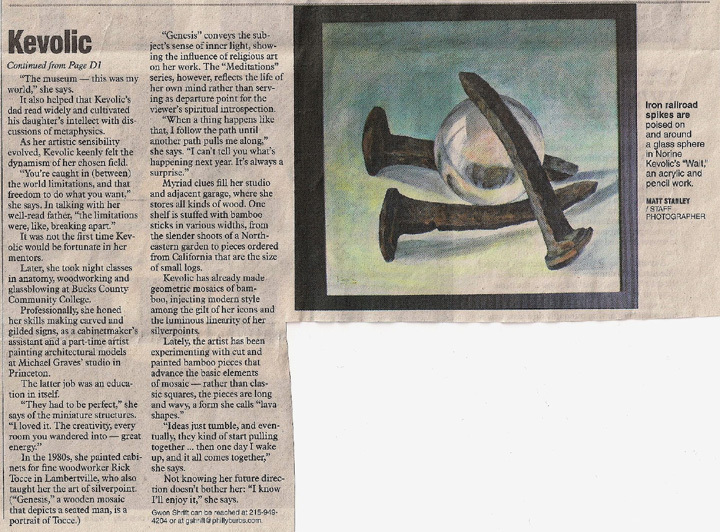 Thanks to writer Gwen Shrift for putting my artistic output (so far) into a nut shell. No small task! 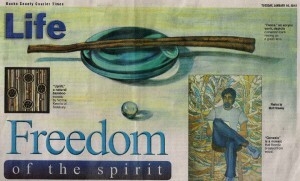 Some of the highlights of my journey as an artist are in this article. 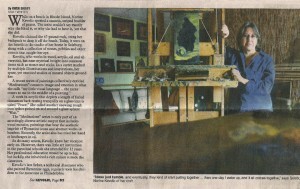 It was recently published in the local Calkins newspapers: Bucks County Courier Times, Burlington Times, Intelligencer, and on www.phillyburbs.com. The photos were taken by Matt Stanley. Thanks Gwen and Matt! 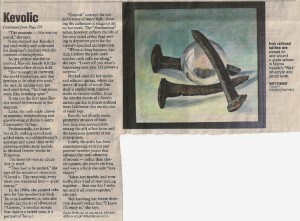 Please email Canal Frame-Crafts Gallery for purchase of this framed painting.